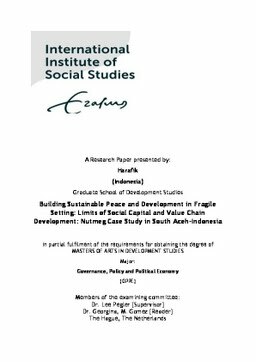 This paper investigates social capital and value chain development in fragile contexts, South Aceh-Indonesia. It aims to explore the extent to which value chain development has fostered social capital that lead to collective action. It focuses on local linkage of diverse local nutmeg value chain actors. It employs qualitative methodology and case study approach. Also it takes critical perspective of social capital and value chain development and frames the analysis on asymmetry power distribution among local chain actors and its implication on trust, collective action in fragile context of South Aceh-Indonesia. The overall research finding is that value chain development and social capital are necessary but not sufficient conditions in fragile context. VCD and social capital helps reduce transaction cost and foster collective action but simultaneously they benefits powerful and wellconnected groups at the expense of disadvantaged ones. Thus these two concepts have to be applied critically in fragile context when it comes to create sustainable peace and inclusive development. And It has confirmed prior study that fragile context is not necessarily a “zone social capital deficiency”. Rather it both increases and decreases bonding and bridging social capital. In the context of South Aceh relatively speaking value chain development plays some roles to it.